Rare opportunity to own a spectacular home in Park Avenue South Tower, a 1920's art deco era industrial factory building converted to co-op loft apartments in 1980. This magnificently renovated corner 4 bedroom, 2.5 bath loft apartment has it all. The gracious entrance foyer leads to the expansive dining area and living room with soaring 11 ft beamed ceilings and hardwood floors. With an impressive 11 oversized windows with South and West exposures, the space is ideal for entertaining or quiet enjoyment. The kitchen is a chef's dream and features a modern split level Carrera marble and wood plank countertop, custom walnut cabinets, a Viking vented range and Subzero refrigerator. There is a separate super glam bar with custom cabinetry and a wine cooler that holds up to 78 bottles. Off the kitchen is a separate home office with custom cabinetry adjacent to which is an enormous walk-in storage closet/mud room. A long and gracious hallway leads to the bedroom wing. The master bedroom has 6 closets, a dressing area and an ensuite master bath featuring dual sinks with marble countertops and dual head steam shower. The three other bedrooms all have great light and views. There is a large powder room with terrazzo and glass tile, XO sink and Hans Grohe faucet. The second bathroom has a custom 72 inch Zuma deep soaking tub. The apartment has a two-zone central a/c system and a four-zone surround sound system. A pet friendly building with a live-in super, laundry on every floor and a magnificent planted roof deck with 360 degree views of Manhattan. Doorman hours: Monday-Thursday: 8:00am-1:00am, Friday-Saturday: 8:00am-2:00am, Sunday: 10:00am-2:00pm. Unlimited subletting allowed after two years of ownership. One pet up to 35 pounds allowed. 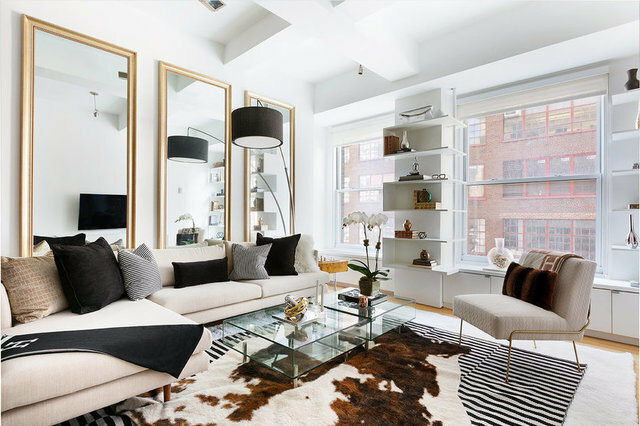 Located in the coveted NoMad district, the apartment is in close proximity to Madison Square Park, Gramercy Park, Gansevoort, Eataly, The Ace and The Breslin. Just 1 block from the 6 train subway stop at 28th Street. All private showings will require at least 24 hours notice. This wonderful home is priced to sell and will not last!